Founded in 1880, Starrett is a reputable manufacturer of over 5,000 variations of saw blades, measuring instruments, and precision tools. Recognized as the World’s Greatest Toolmaker, the company serves professional, industrial, and consumer markets around the world. Specialized industries pertaining to aerospace, energy, etc., are known to utilize Starrett tools to cut, form, and assemble exotic materials and parts. Today, Starrett has eight manufacturing locations around the globe, including five locations in the United States, and the rest in China, the United Kingdom, and Brazil. Starrett continues to broaden its product offering via innovative product line expansion and corporate acquisitions. What are Digital Force Testers? 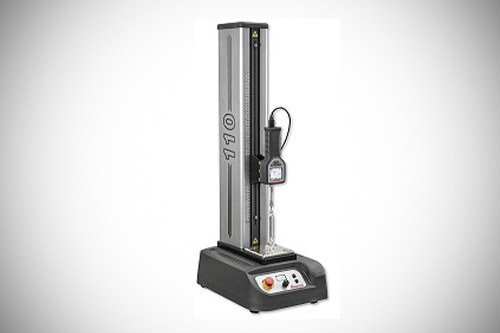 A digital force tester is designed for R&D, quality assurance and control, material testing, lab, and educational applications. It is important to measure force because manufacturers need to optimize their processes, products, and materials to achieve maximum safety and performance at a minimal cost. That’s why many manufacturers subject their products and materials to force testing procedures to determine the perfect manufacturing mix. They test to see which forces causes their work pieces to become loose or break. For example, how much force destroys wires or metal pipes. Availability: You can order the new testers in several configurations: manual and digital force testing stands and frames or handheld force gages. Various force solutions: L2, S2, L2 Plus and L3 systems are designed to help to tackle complex and sophisticated testing procedures. Compliance and configuration: The new frames have configurable I/O that can be used along with annunciators. FMM test frames are also CE-compliant. Precision and repeatability: The combination of a pre-loaded linear rail and grounded ball screw offers more precise and repeatable travel. Duration of usage: The latest frames can perform hold tests and cyclic tests for up to 27 hours. Adjustable base plate: The base plate features cast aluminum, which offers stellar durability and rigidity. You will be able to perform sample alignment procedures in seconds without any dependence on special tools. Multiple force capacities: The new FMM series test frames are available in 550lbf, 330lbf, and 110lbf. Easy fill-in-the-blank templates: It comes packed with the software by default. You can analyze, measure, perform, and create tests, e.g. cycle testing, constant-hold testing, break testing, limit testing, etc., with exceptional ease. Export features: You can easily export raw data to Excel for statistical analysis and reporting. Application of tolerances: You can now apply tolerances for immediate pass/fail indication. Stellar control: L1 software gives users full computer control in a Microsoft Windows environment.